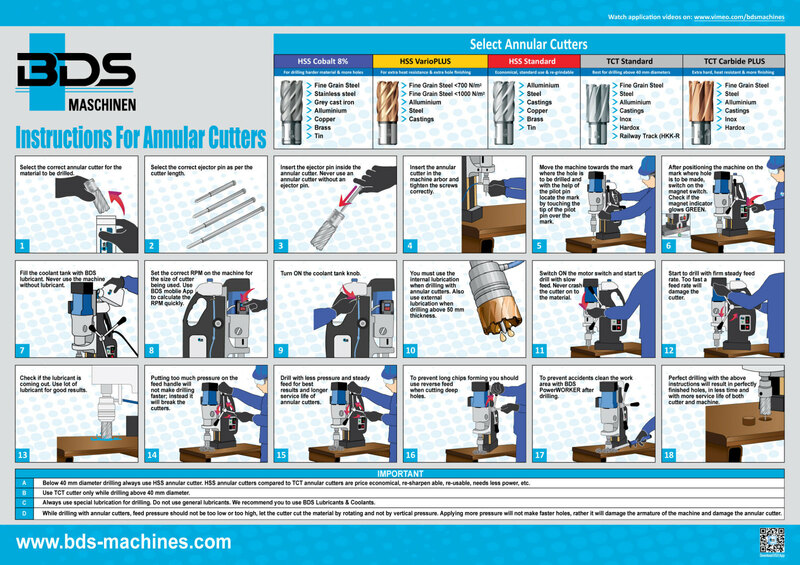 Annular Cutters Know-Hows, Beveling Machines Troubleshooting And All Other Question Regarding These Products You Are Looking The Answers For. Click on the queries to get the answers. 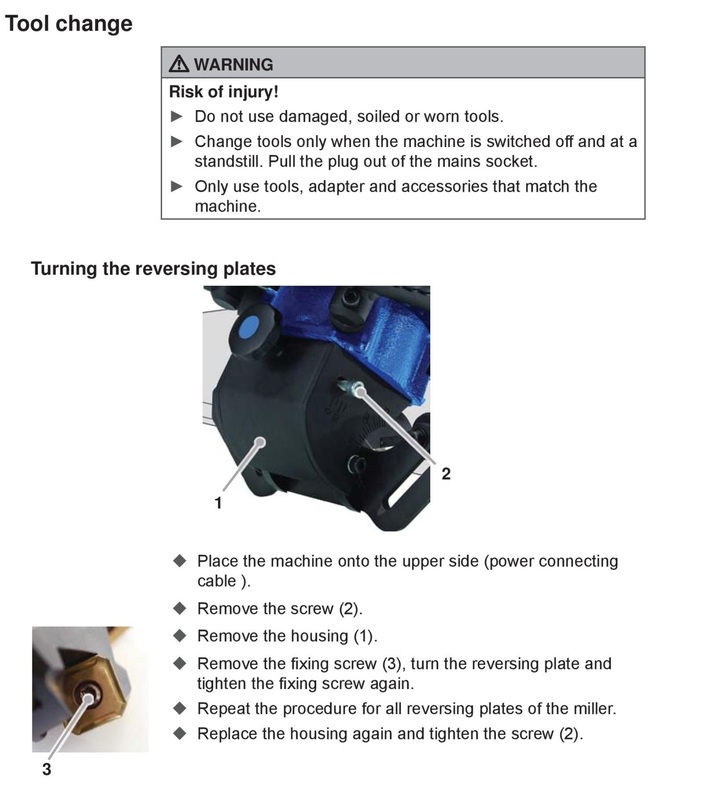 Operate the machine only with the protective equipment stipulated in these operating instructions (see section Personal protective equipment). Do not wear protective gloves when the machine is running. 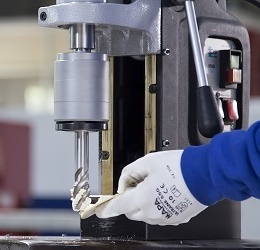 A glove can be caught by the drilling machine and torn off the hand. Risk of losing one or more fingers. Remove loose jewellery before beginning work. Wear a hair net if you have long hair. 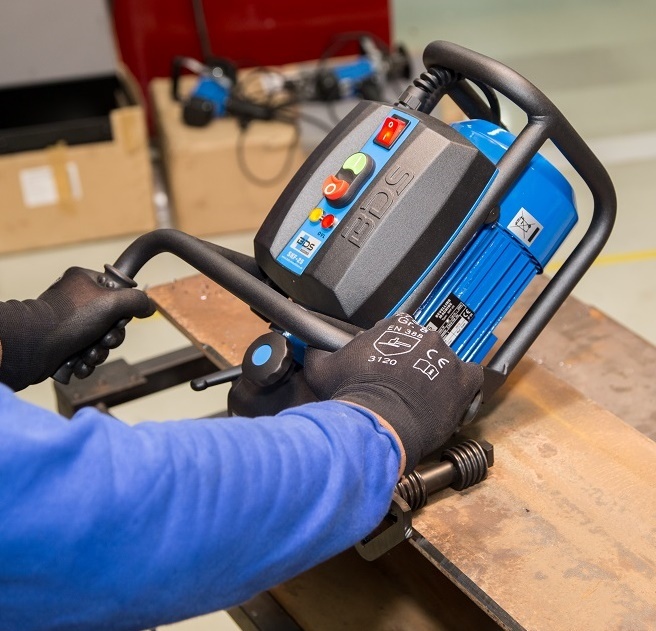 Always switch off the machine before changing tools, performing maintenance or cleaning. Wait until the machine has come to a complete standstill. 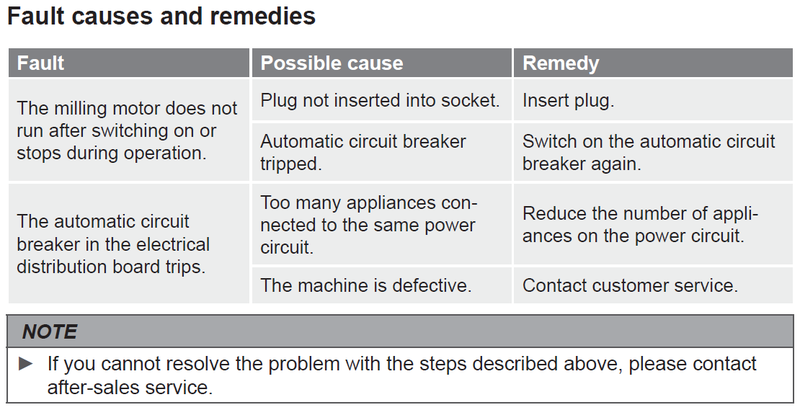 Always remove the plug from the mains socket before changing tools, cleaning or performing maintenance, in order to avoid unintentional starting of the machine. Do not put your hand into the machine while it is in operation. Remove shavings only when the machine is at a standstill. Wear protective gloves when removing swarf. 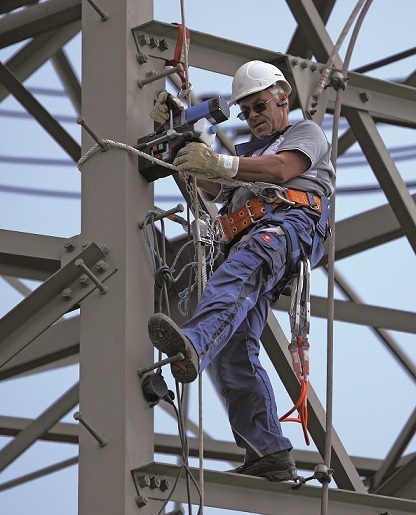 When working on scaffolding, the operator must be secured with a safety belt as the machine can oscillate dangerously in the event of interruption to the power supply. Check for secure clamping of the electromagnets on the substrate before every use (see section Preparing). 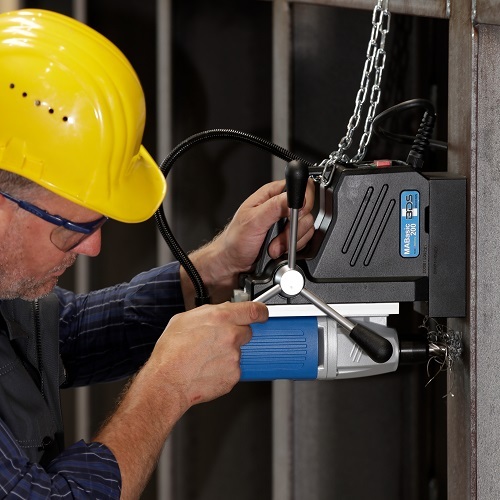 Secure the machine with the safety chain supplied when working from an inclined or vertical position or during overheadwork. The machine could fall down if the magnet is loosened or the power fails. Check that the tool is tightened securely before using (see section Inserting the tool). Do not allow the connecting cable to hang over edges (danger of tripping). 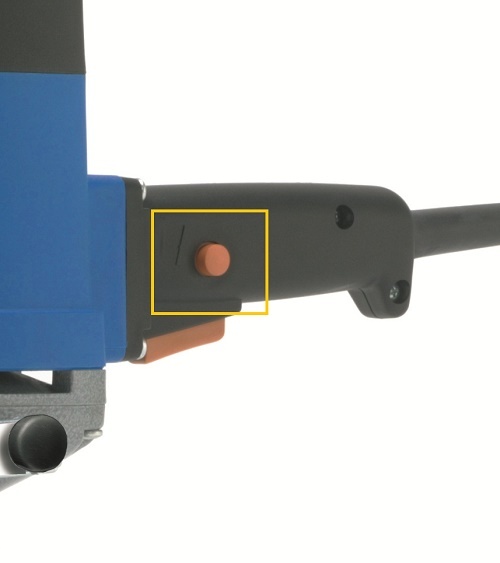 The magnet indicator provides a visual control of the magnet’s clamping force. 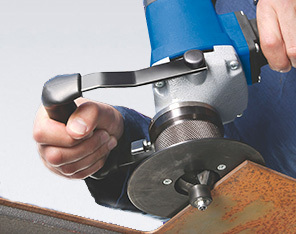 The magnet’s clamping force satisfies the minimum requirements. Machining can be carried out. Insufficient magnet clamping force. Machining must not be carried out with the machine. This can be the case in the event of insufficient material thickness, uneven surface or due to paint, scale or zinc coatings. The machine is additionally equipped with thermal overload protection. If the machine becomes too hot, it switches off automatically. Remove any blockages that may have occurred. Allow the machine to run at no-load speed for approx. 2 minutes. The machine is then ready for operation again. Risk of injury from the falling machine. When working in inclined or vertical position and during overhead work, the machine must be secured to prevent it from falling using the safety chain (E) supplied. 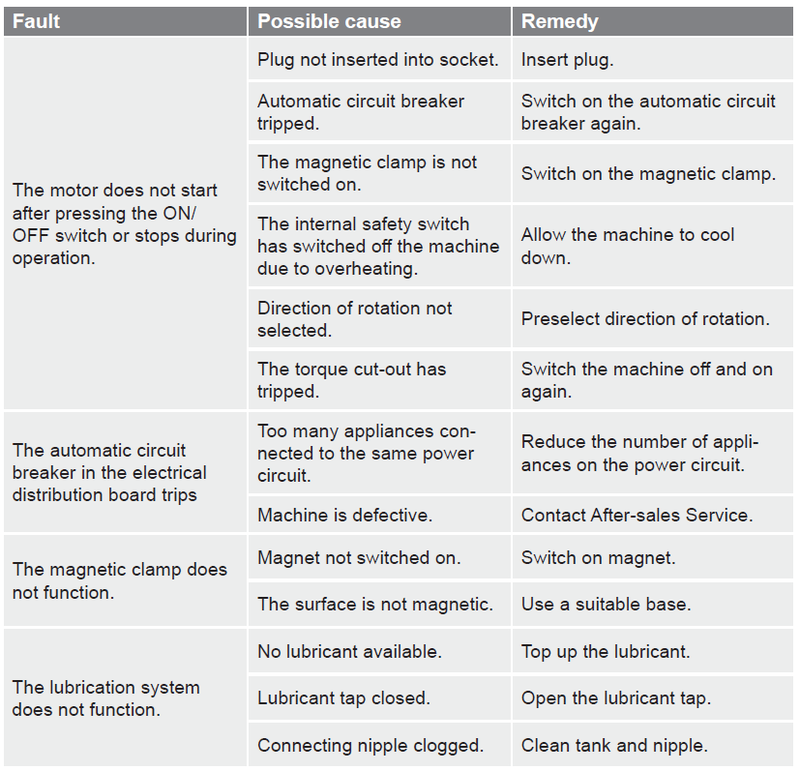 Check the safety chain for proper function before every use. A damaged safety chain must not be used. Replace a damaged safety chain immediately. Attach the safety chain in such a way that the machine moves away from the operator in the event of slipping. Lay the safety chain as tightly as possible around the handle of the machine. Check the secure fitting of the safety chain and lock before starting work. Use the protective equipment stipulated in chapter Personal protective equipment. 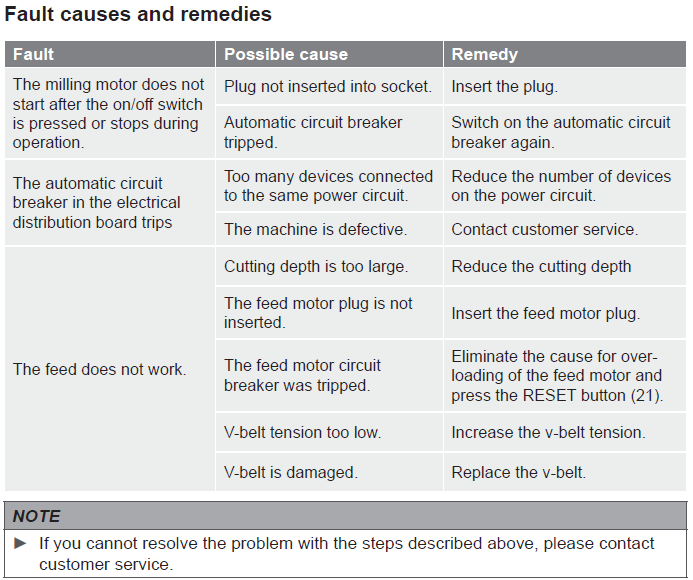 Risk of falling from sudden oscillating movements of the machine. When working on scaffolding, the machine can make a sudden oscillating movement on starting or in the event of a power failure. Secure the machine with the safety chain (E) supplied. Wear a safety belt to protect yourself from falling. The magnet clamping force is dependent on the condition of the substrate. 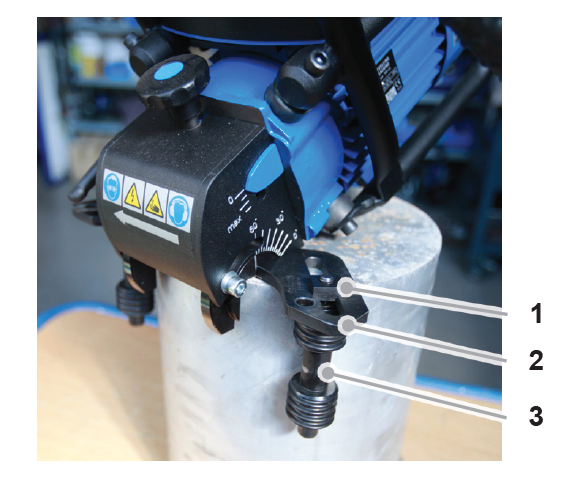 The clamping force is significantly reduced by paint, zinc and scale coatings and rust. The substrate must be magnetic. 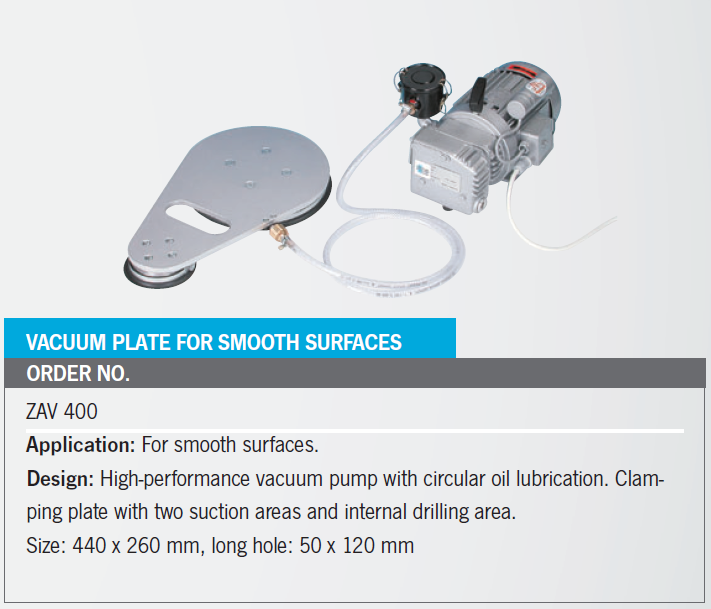 The clamping surface and the magnetic foot must be clean and grease-free. The clamping surface must be completely smooth and level. 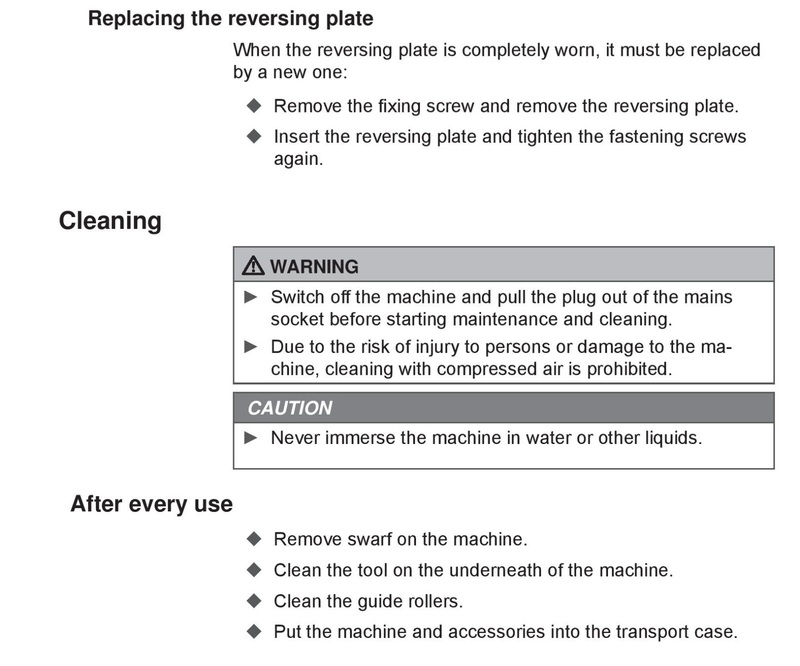 Clean the substrate and the magnetic foot of the machine before use. Remove any unevenness and loose rust from the substrate. 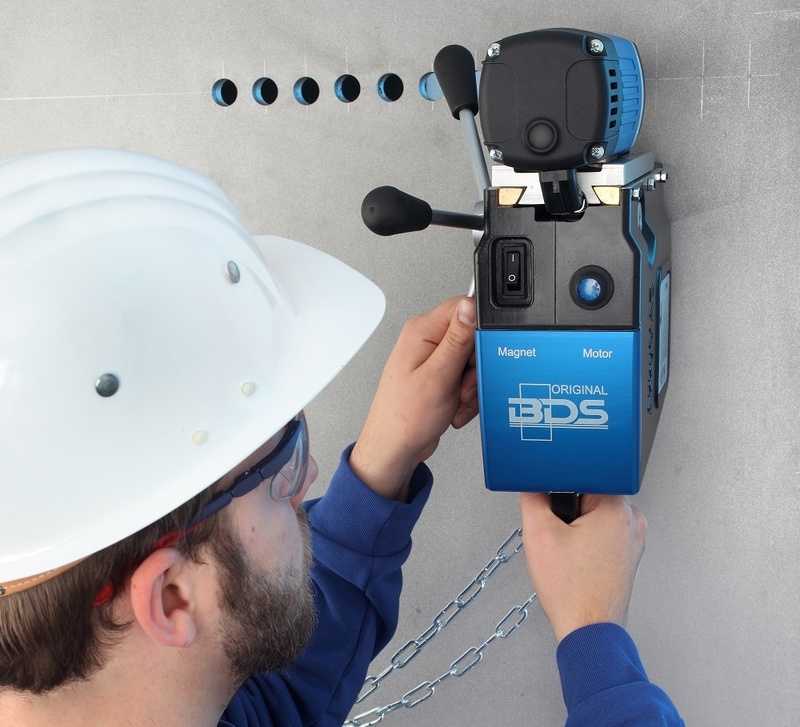 BDS offers special holding devices in its range of accessories. The best clamping effect is obtained on low-carbon steel substrate with a thickness of at least 20 mm. The best clamping effect is obtained on low-carbon steel substrate with a thickness of at least 20 mm. 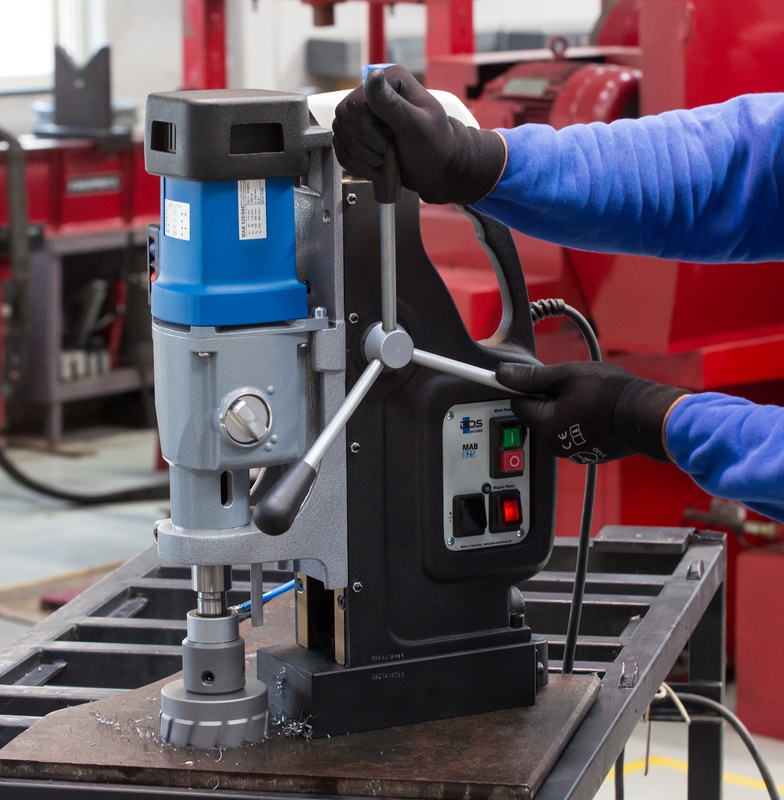 A special holding device must be used when drilling in NF metals. BDS offers 2 Clamping devices For magnetic core drilling machines of the ProfiPLUS and ProfiSTART class. For tube processing and drilling of nonferrous metals and stainless steel. 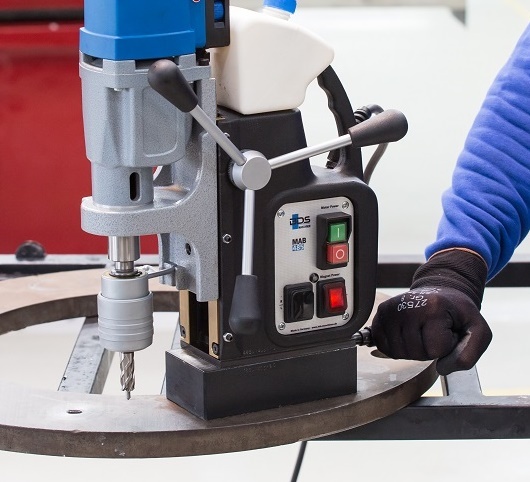 Magnetic core drilling machines from the ProfiPLUS class can in their entirety also be used for the processing of non-ferrous metals and stainless steel. between the magnetic core drilling machine and the workpiece. Furthermore, BDS offers customized devices, which exactly meet your requirements and instructions. Just contact us! 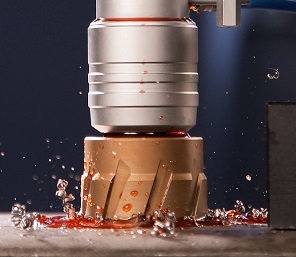 Push the KEYLESS quick-change drill chuck system intothe morse taper of the machine. 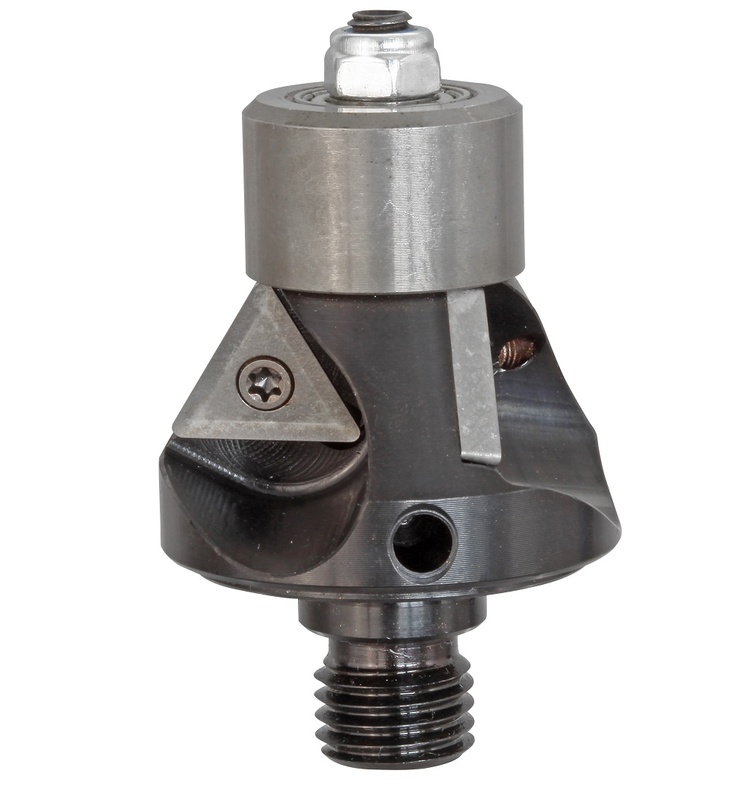 Open the quick-change drill chuck system by pushing up the sleeve and insert the tool into the chuck. Insert the appropriate ejector pin before inserting the core drill. 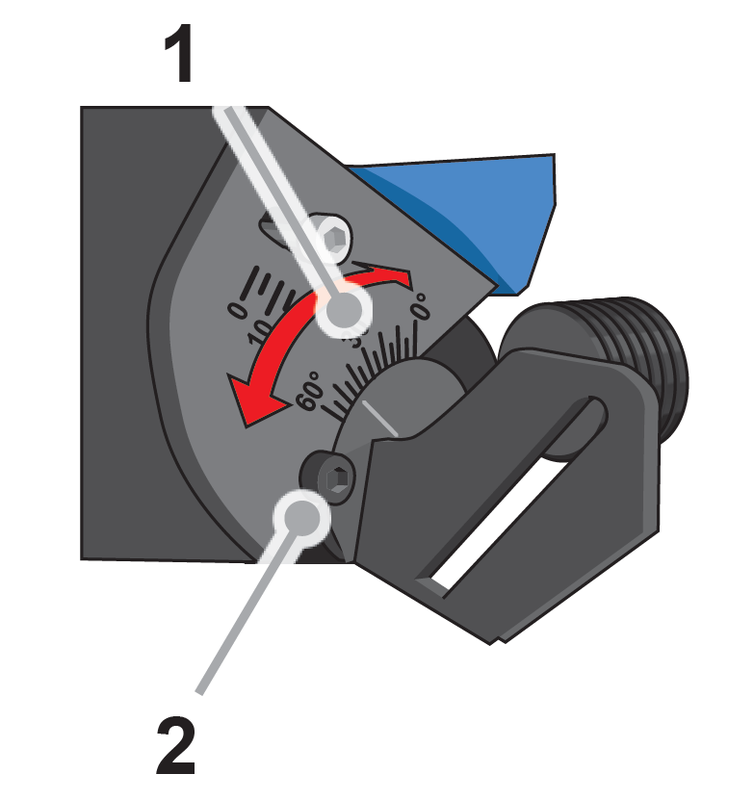 Check by briefly turning the tool whether the collet is engaged. 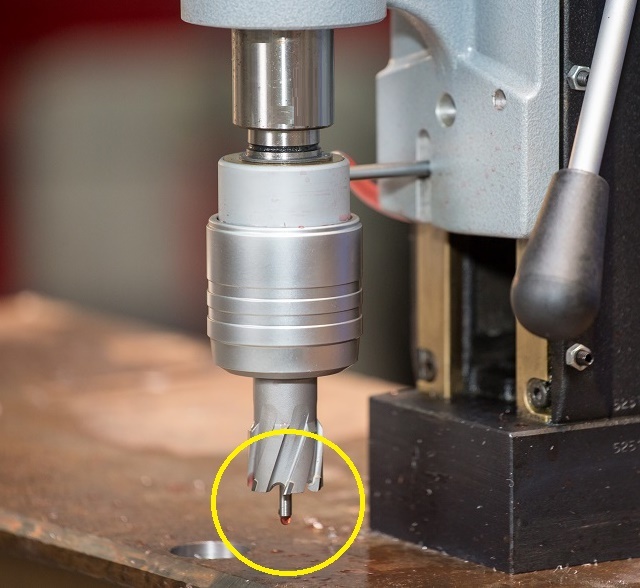 Open the quick-change drill chuck system by pushing up the sleeve and pull the tool down out of the chuck. The BDS magnetic drilling machines are provided with speed gears and the ProfiPLUS machines are also equipped with variable speed control. As per the diameter of the annular cutter and the type of annular cutter the speed of the magnetic drilling machine has to be set. 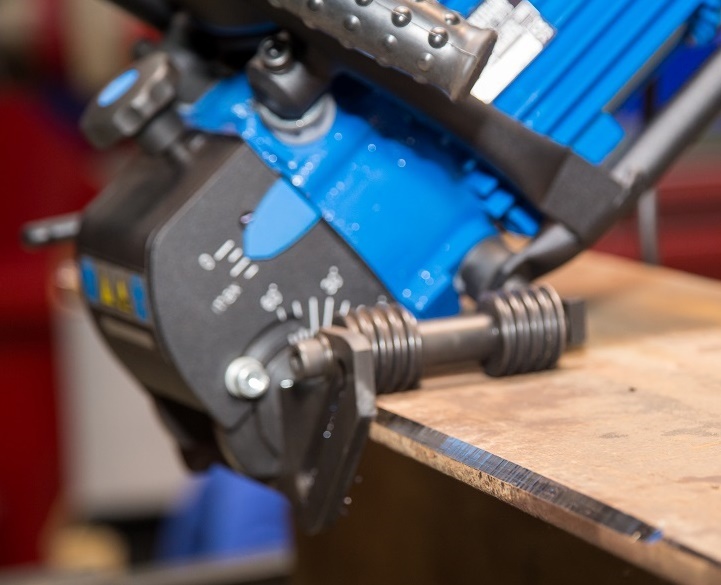 The alternative easy way to calculate the cutting speed is to use our automated RPM calculate on the website CLICK HERE or download our App CLICK HERE. Once the speed or RPM has been calculated the next step is set the gears as per the RPM. BDS has in its range two gear and four gear machine. The machine has a gearbox with four mechanical gear stages: The gear stage is selected by means of the two selector levers on the side of the gearbox. 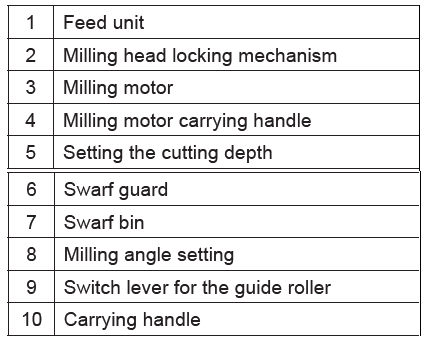 To select the desired gear stage, set the two selector levers to the desired speed as shown in the table below with the machine switched off. can also be fine tuned with the help of the variable speed control. 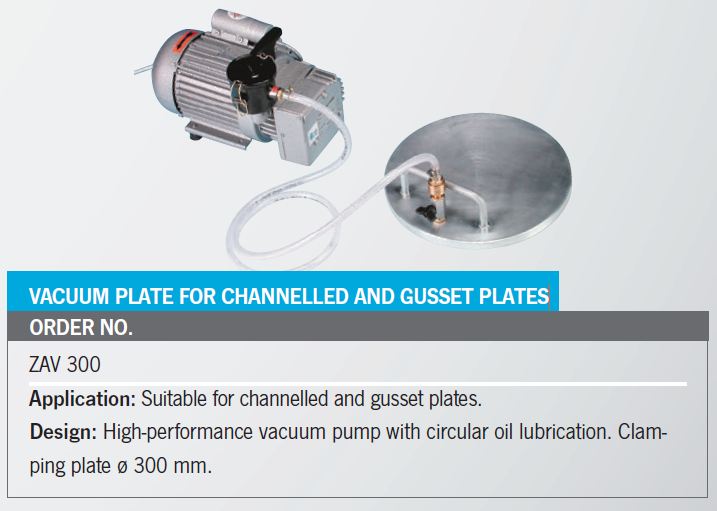 The BDS ProfiPLUS models MAB 525, 525SB, 825, 825V, 845 & 1300 are equipped with variable torque control. 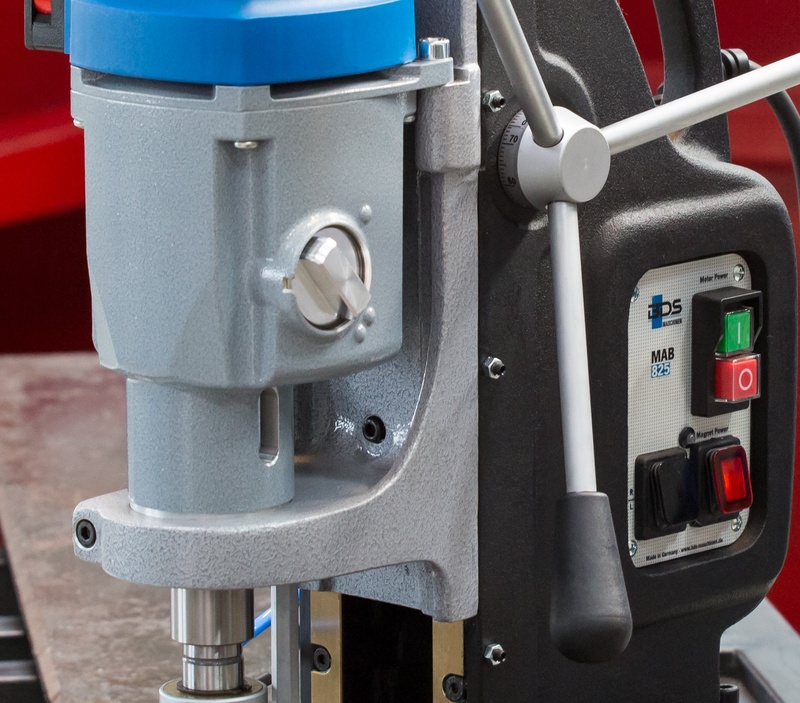 The main purpose of the torque is for tapping or thread cutting where the need of speed is less and power is more. The torque delivers the power. More torque is more power. 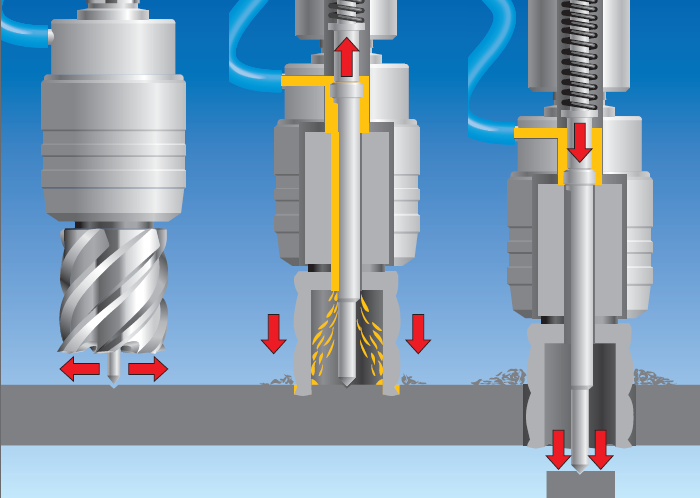 As a thumb rule for drilling as well as for tapping keep the Torque control as maximum. The other main advantage of the torque control is to protect the tool from brackage. 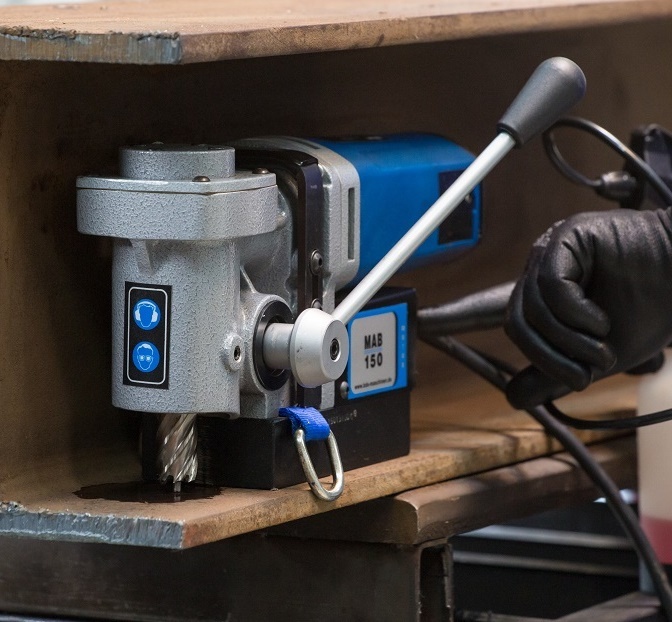 In order to protect the tool, the maximum torque of the machine can be set using the controller. When the maximum set torque is reached, the machine switches off. After the cut-out, the machine must be switched off and then on again at the ON/OFF switch. 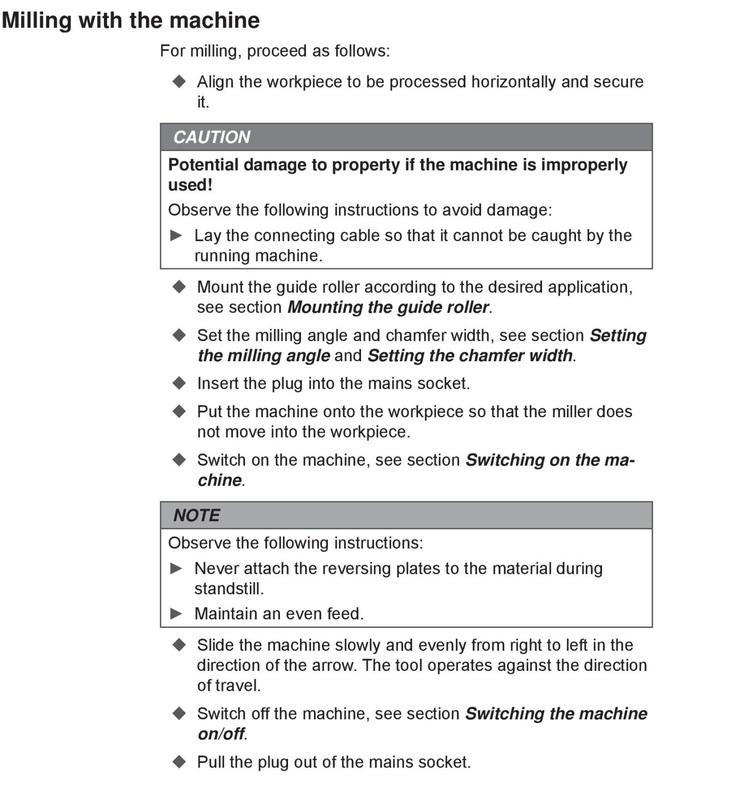 Do not use this function to switch off the machine when cutting threads in blind holes. the machine to be rotated by 30° to both sides and by 20 mm forwards and backwards with the magnetic foot engaged. Loosen the locking device of the rotating mechanism. Position the upper part of the machine laterally and longitudinally. Lock the rotating mechanism again. The machine is equipped with a reversible direction of rotation and can also be used for cutting threads. Drill the hole for the thread. Switch off the machine and select the lowest gear stage and speed. Set the direction of rotation to clockwise (right = R) at switch. Chuck the thread tap in the machine using the appropriate drill tap adapter. Switch on the machine and set the thread tap onto the drilled hole. Guide the machine slide down at hand lever without exerting pressure until the desired thread length has been cut. 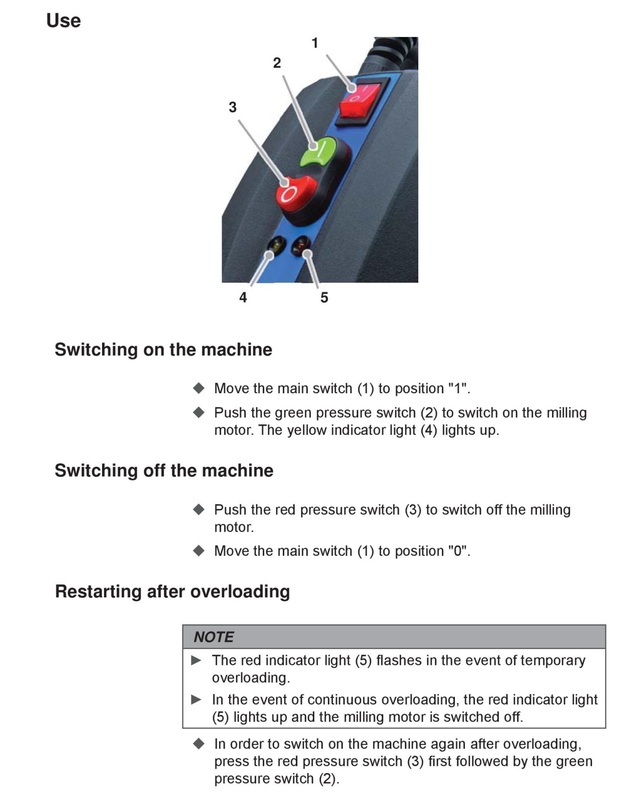 Switch off the machine and set the direction of rotation to anti-clockwise (left = L) at switch. Switch on the machine again and allow the thread tap to come completely out of the workpiece. Then guide the machine slide upwards at hand lever to avoid damaging the start of the thread. machine requires a tapping adapter. Note: For each size a specific adapter is required. A single adapter can not be used for multiple thread sizes. 2. 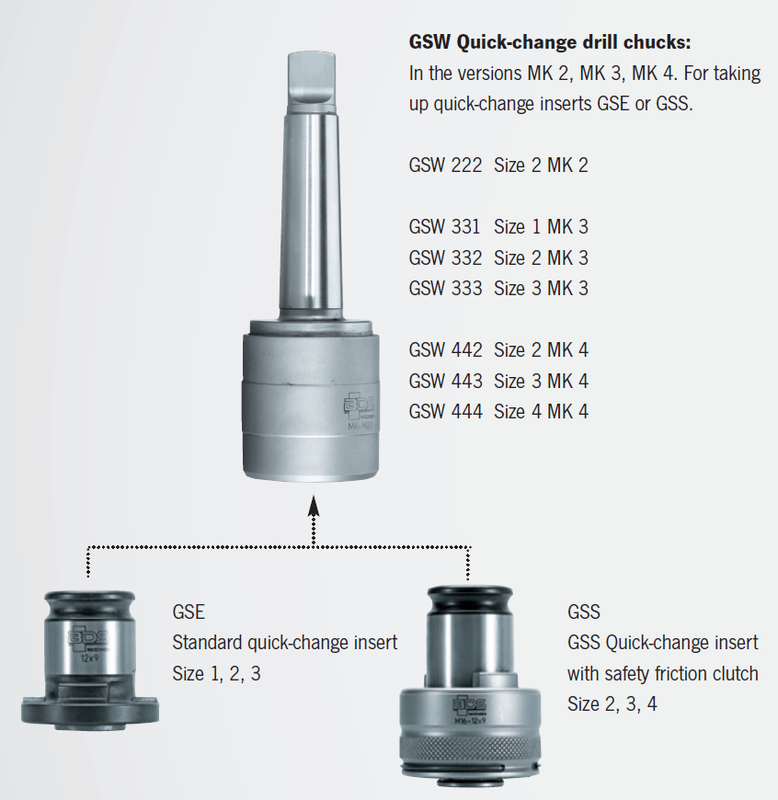 As per the thread size and the morse taper of the machine select the GSW Quick-change drill chucks. 3. Select the quick chnage insert for the thread size. 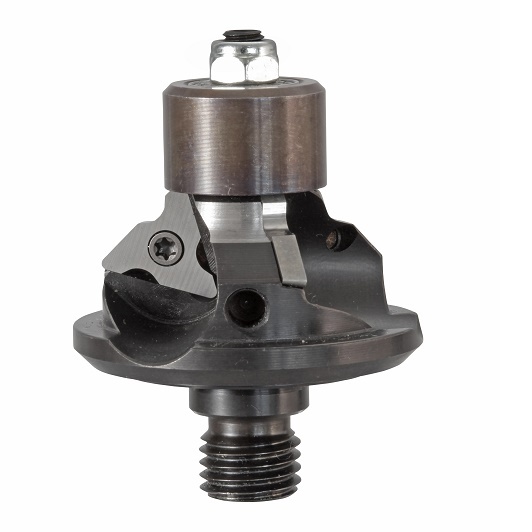 For through holes use GSE Standard quick-change insert. or thread cutting tool inside quick-change insert. The above is a professional option for quick tapping. 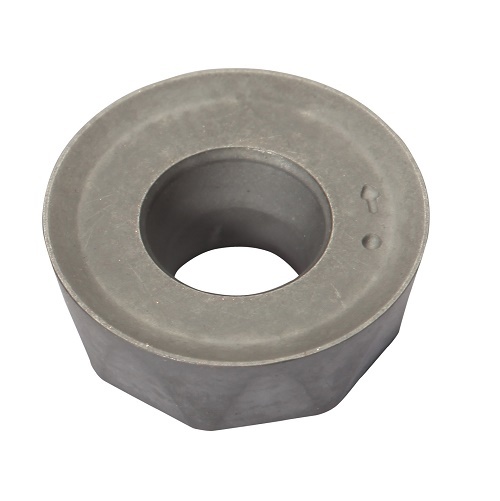 If, your requirement is to save money and not time then we recomend you an economical option for tapping adaptor with Weldon shank. 1. Select the TAP ADAPTER WITH WELDON SHANK as per the size of the thread. 2.Insert the tap or thread cutting tool in the tap adapter. 3. Insert the tap adpter in the machine. dropdown menu or just CLICK HERE. 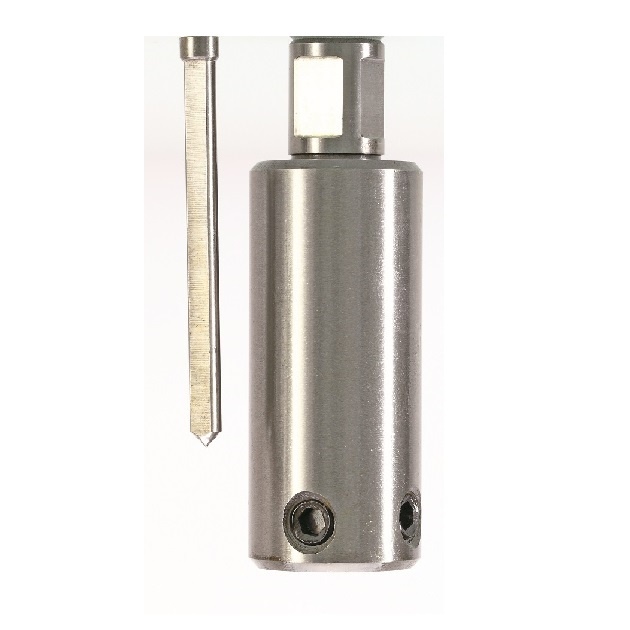 For bigger diameter of twist drills which comes with Morse Taper shaft dont need any adapter. You can directly fix the twist drill on the machine. 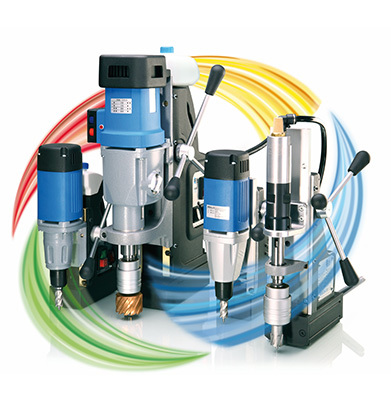 BDS have mainly four categories of magnetic drilling machines. 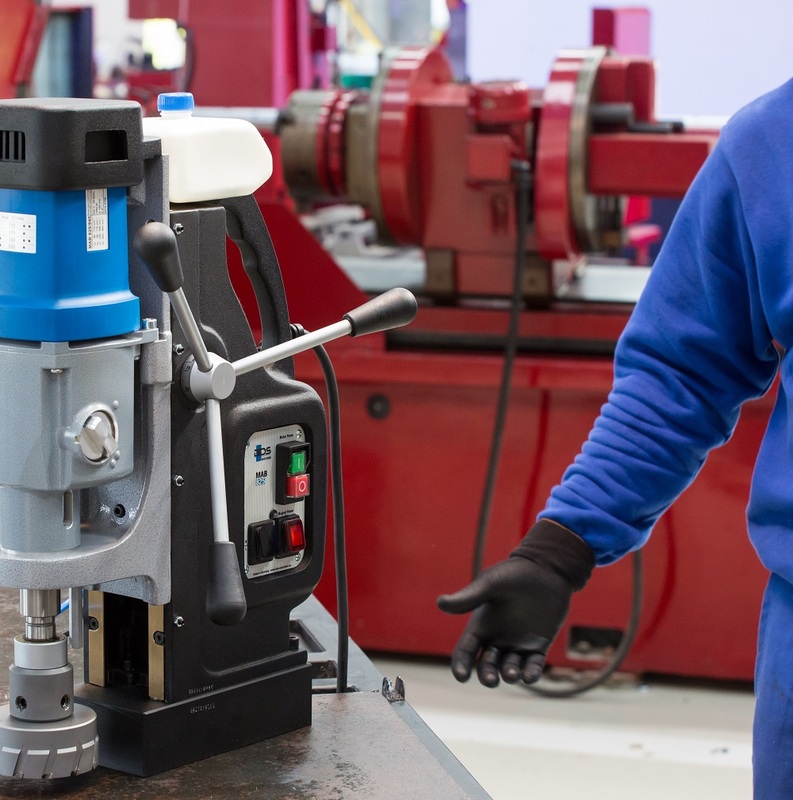 These machines are for drilling, tapping, countersink and reaming operations. 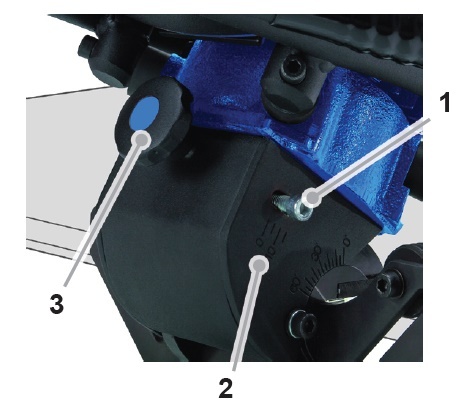 change the motor direction to anti-clockwise and remove the tap without damaging the thread. These machines also have variable torque control, which means motor power, its needed for tapping. 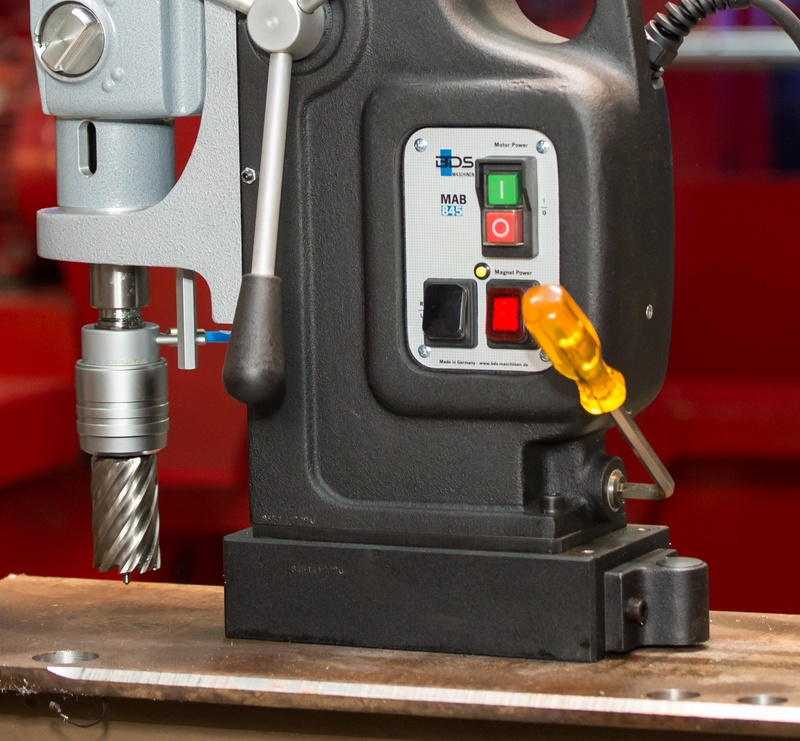 These machines have variable speed control required for drilling, tapping, countersink and reaming operations. Most important these machines have oil bath gearbox. This gearbox is very robust compared to grease gearbox of other machines. These machines are for ONLY for drilling because they don’t have reversible motor and don’t have torque controls. 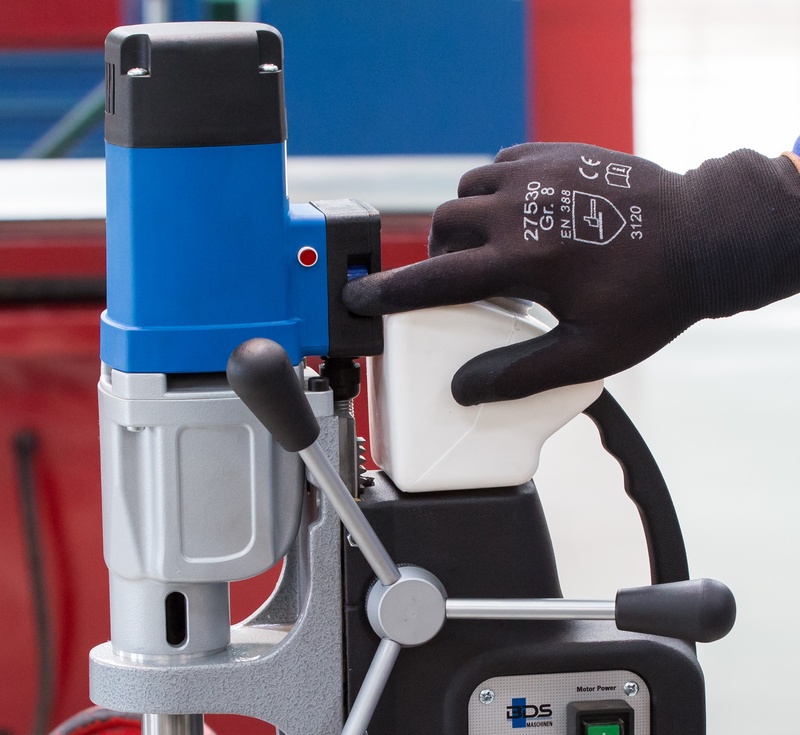 Also these machines are equipped with magnet indicator, carbon brush indicator, Internal cabling, KEYLESS drill chuck for easy change of tool, etc. gearbox, they do not have internal cabling, no KEYLESS drill chuck and no indicators. 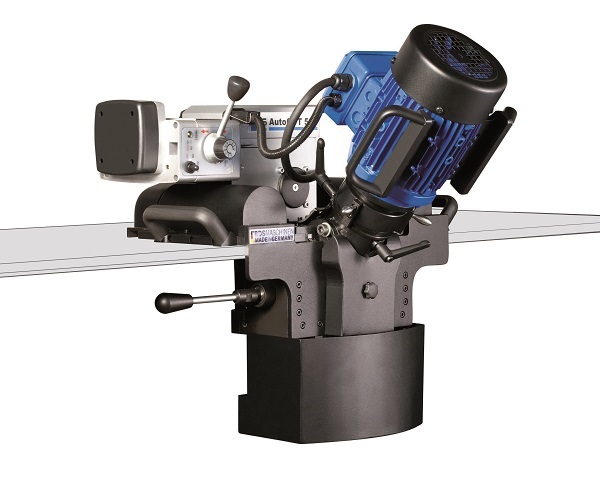 The purpose of these machine is to have an price economical magnetic drilling machine range. These machines are good for regular use but for heavy duty use we recommend ProfiSTART. 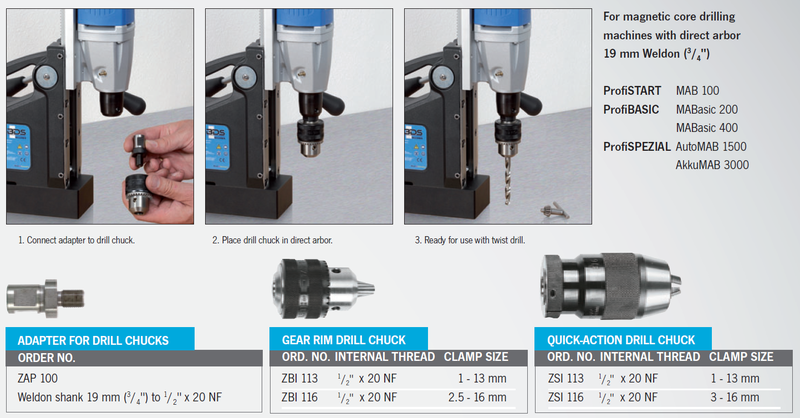 These are special purpose drilling machines as below. We also have the above poster in various languages like french, Spanish, Turkish, Portuguese, Italian, hindi, Tamil, Serbian, etc. Achieve longer length by using smaller length anular cutters by using BDS Extention, which has 80 mm length and comes with a longer ejectpr pin ZAK 080. Please see the below video to know more about BDS core drills manufacturing at Germany. 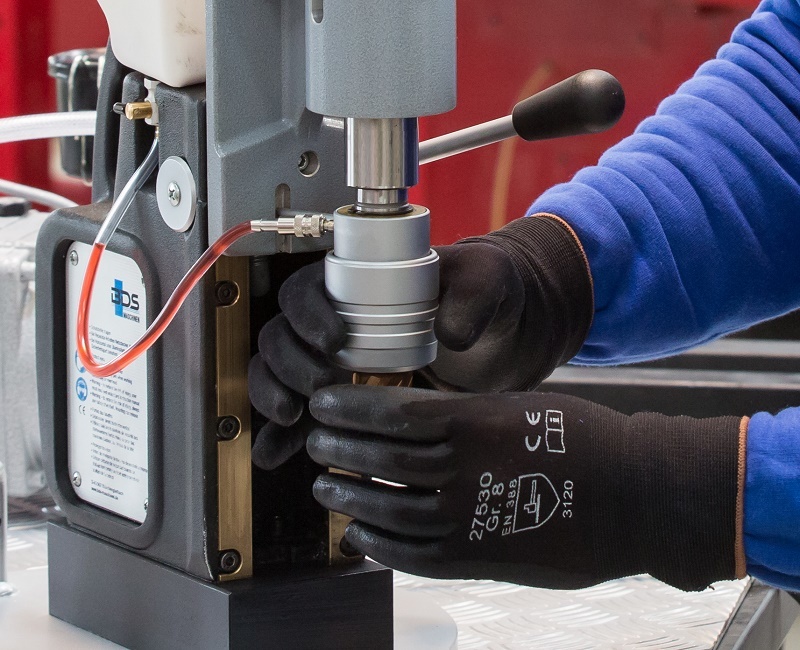 The objective of this most recent product development at BDS was to produce a range of core drills optimised for power with greater heat resistance and better protection against wear. 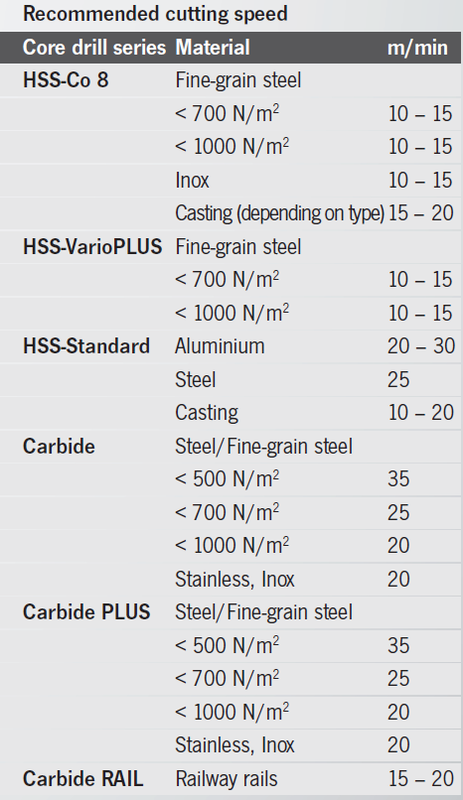 characteristics.The HSS Cobalt 8% core drills are made from M 42 steel. 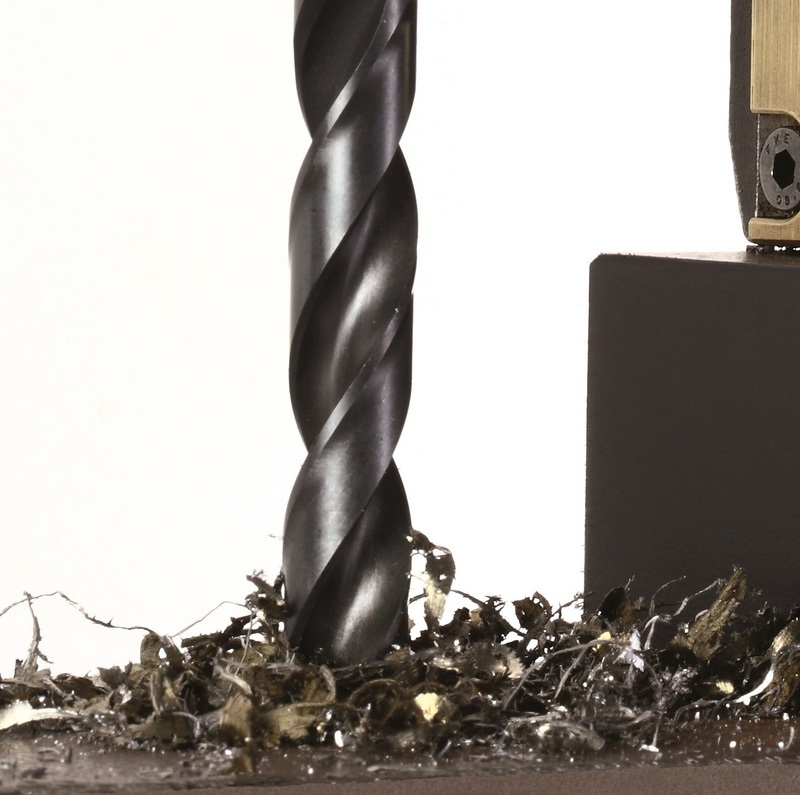 HSS Cobalt 8% Core drills are Harder, Stronger, Have more service life, Make more holes per cutter, etc. 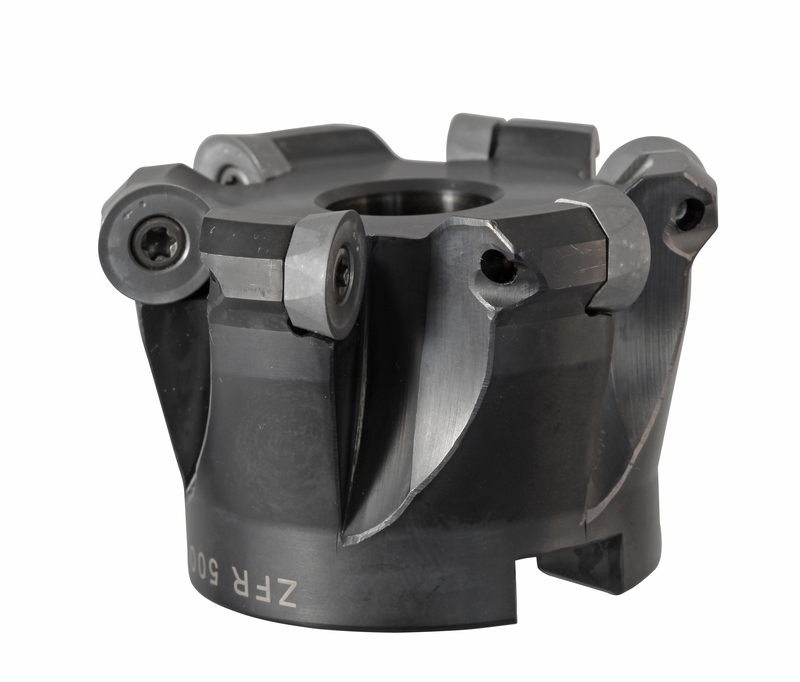 The hard coated annular cutters are used for high heat resistance and extra finishing. 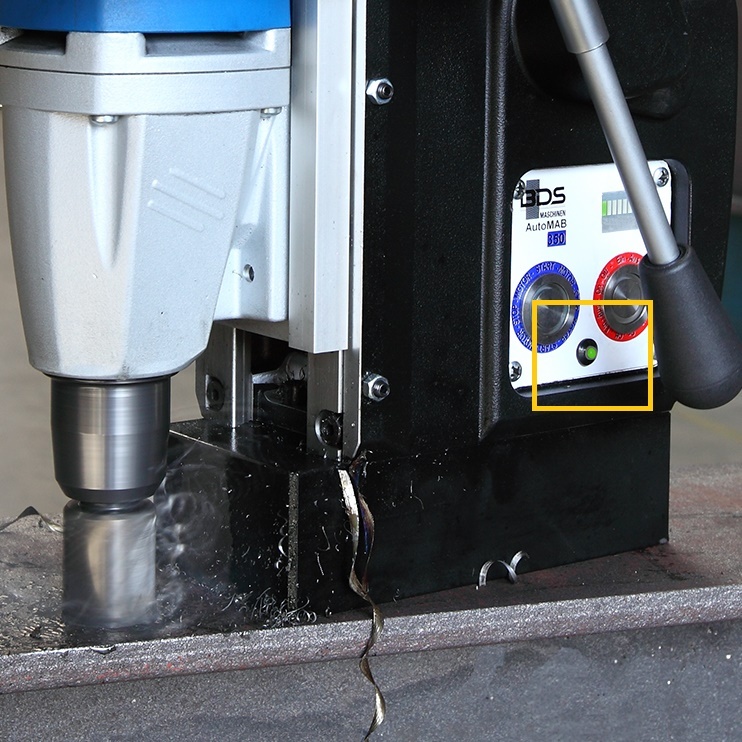 these tools have considerably longer life and more uniform removal of chips, particularly with long drills. to make/drill holes in ferrous and non-ferrous metals. An annular cutter cuts only an annular groove at the periphery of the hole and leaves a solid core or slug at the hole center. saw but differs in geometry and material. 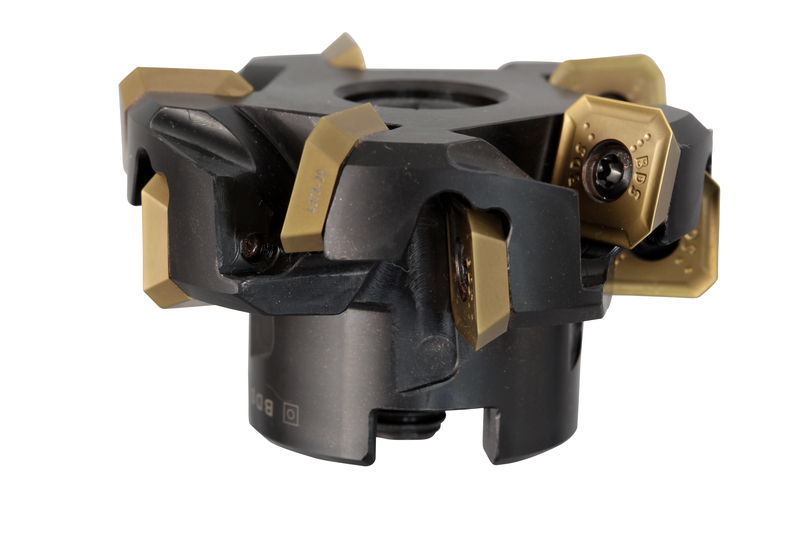 Annular cutters are faster, easier and are more accurate than the conventional twist drills or drill bits. 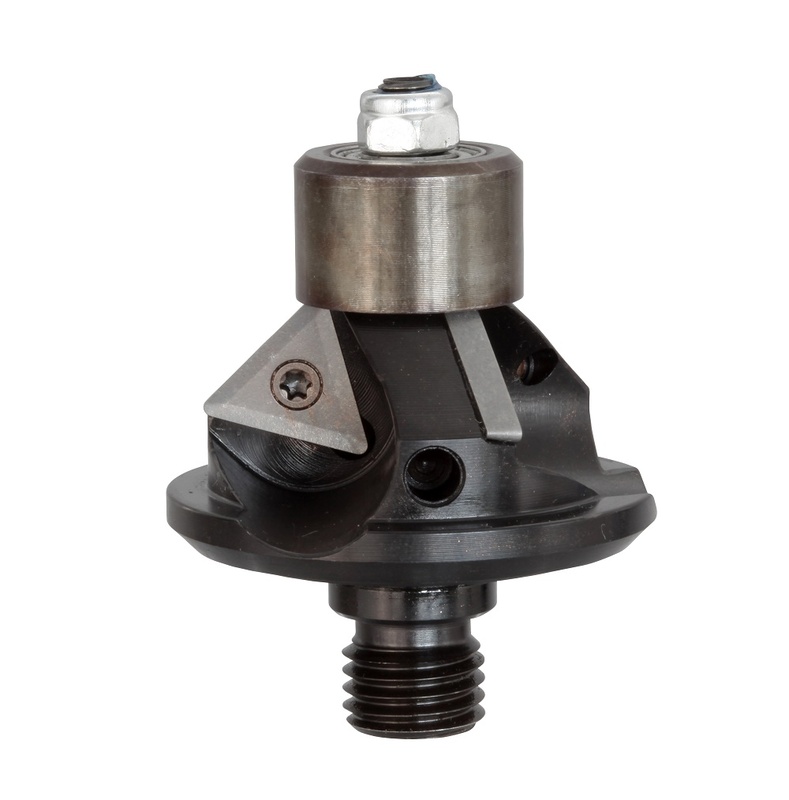 cutting tool and is made from material like high speed steel and tungsten carbide tips. 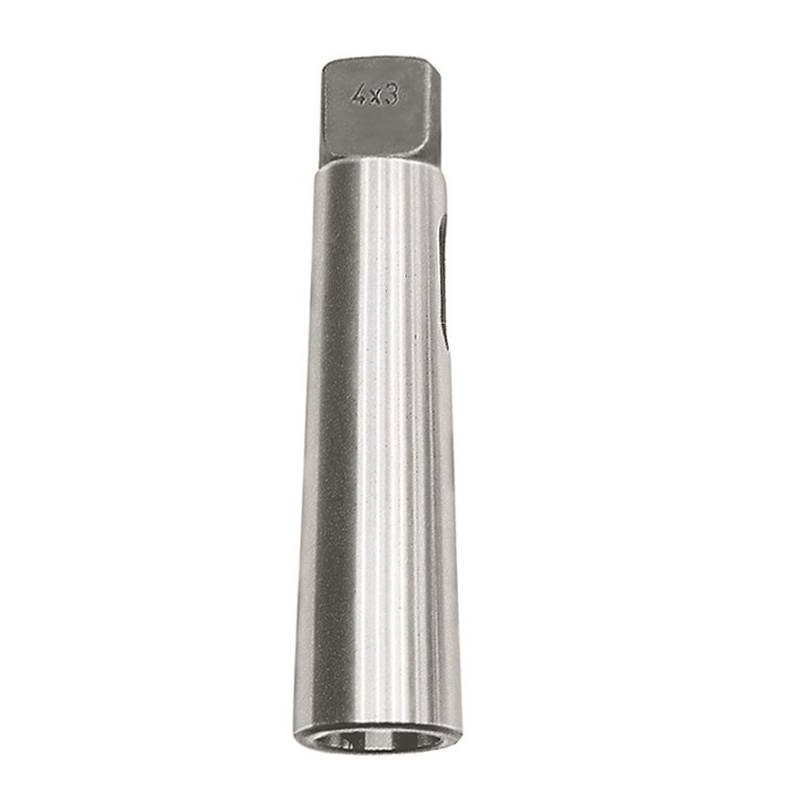 is ejected from the cutter in the form of a cylindrical blank, this blank is called a core. 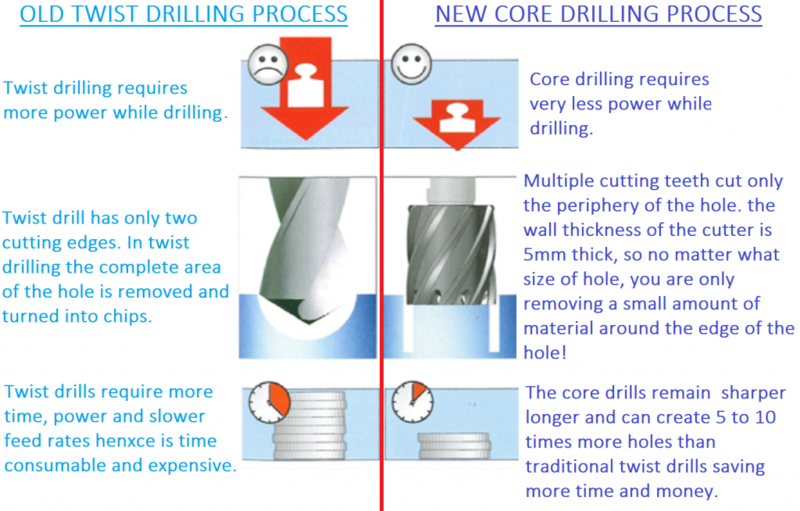 pre-drilling and step-drilling operations for bigger diameter holes, whereas an annular cutter requires no pre-drilling and step-drilling. It is a one-shot drilling operation. 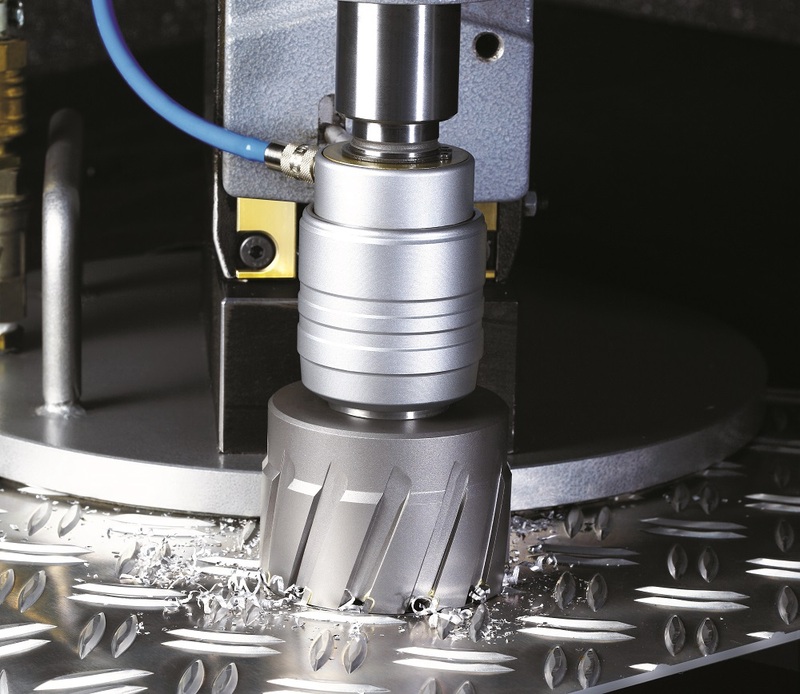 The annular cutters have less teeth and less wear, therefore with an annular cutter holes can be made at higher or faster cutting speed and a faster feed rate of the drilling machine. 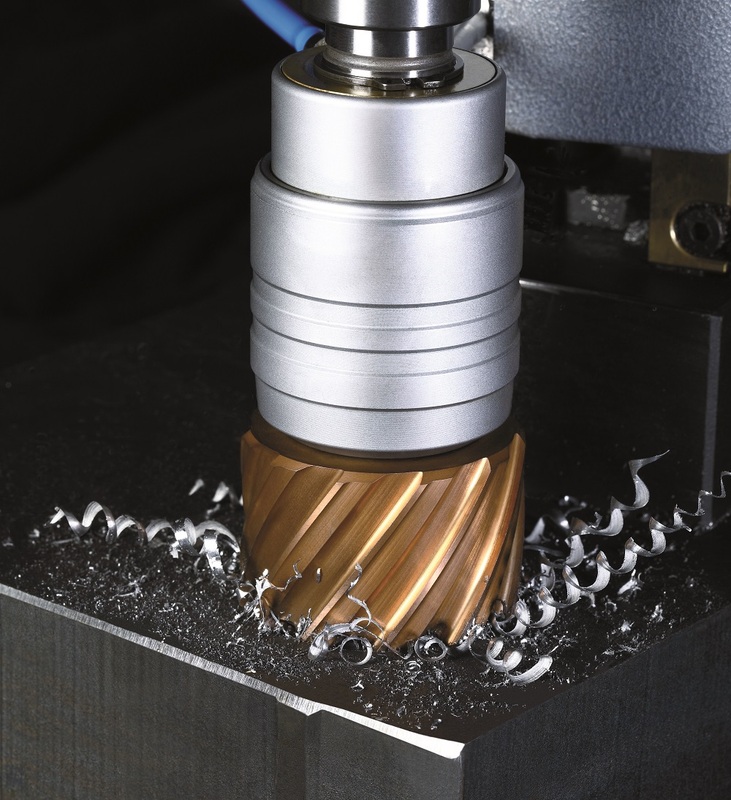 Because annular cutters do not have to drill/cut through the complete work piece, they require less thrust and thus less energy to drill through material. The hole made using an annular cutter is more finished, precise and accurate. Due to the unique geometry of the annular cutters, making holes at awkward angles is also very easy. and more efficient for deep hole drilling. 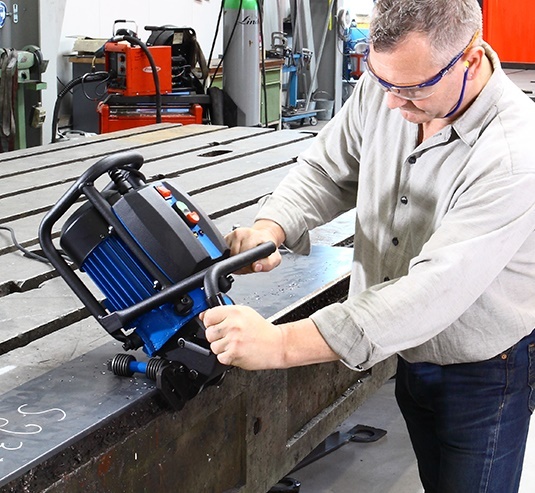 As the annular cutters require very low RPM (from min 50 RPM), these cutters can be easily used with light duty drilling machines or portable magnetic base drilling machines. 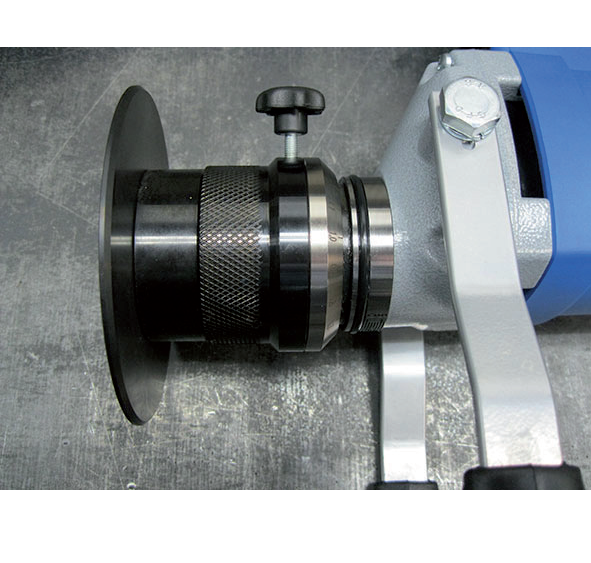 of annular cutters can be sourced depending upon the requirement. 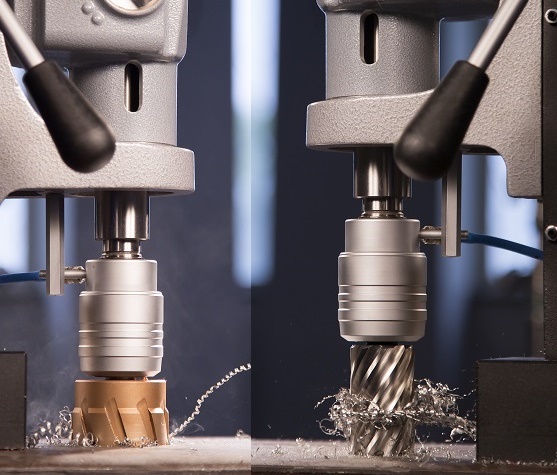 HSS core drills are cheaper than the TCT core drills for smaller diameters up to 40 mm, while TCT core drills are cheaper than HSS for diameters above 41 mm. the chances tip breakage is more. A HSS cutter on the other hand a complete made of one material. good when drilling not very hard material and for small diameter hole sizes. Hardness of TCT core drills is more than the HSS core drills. 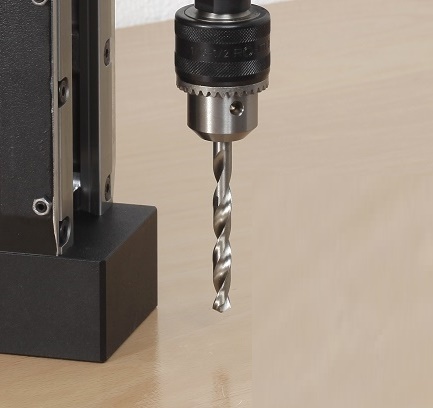 We recomend to use TCT Coated core drills. Because these TCT cutters are harder and the coating makes the cutter more heat resistant. 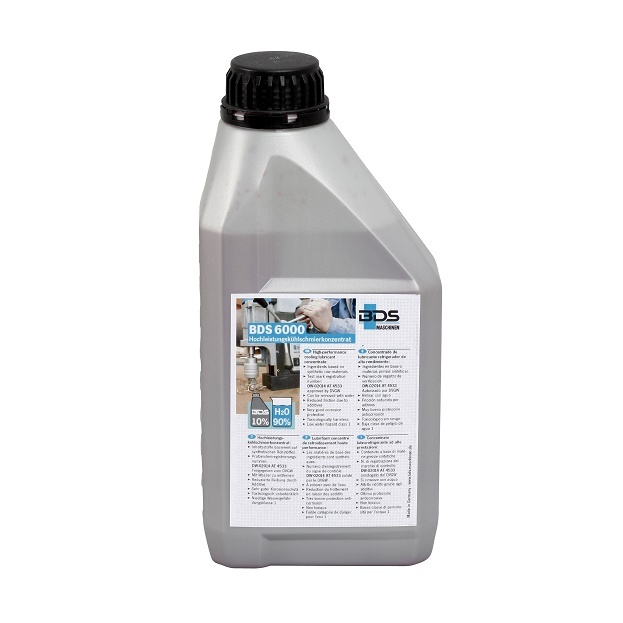 We also highly recomend to use BDS 6000 water soluble lubricants. high performance cutting paste to drill overhead or in horizontal situation. This cutting paste is suitable for both HSS and TCT core drills as well as for thread cutting tools/Taps. Improves the core drill service life. Toxicologically harmless, water hazard class 1. Pure vegetable oil that is not a hazardous good in the context of transport regulations. 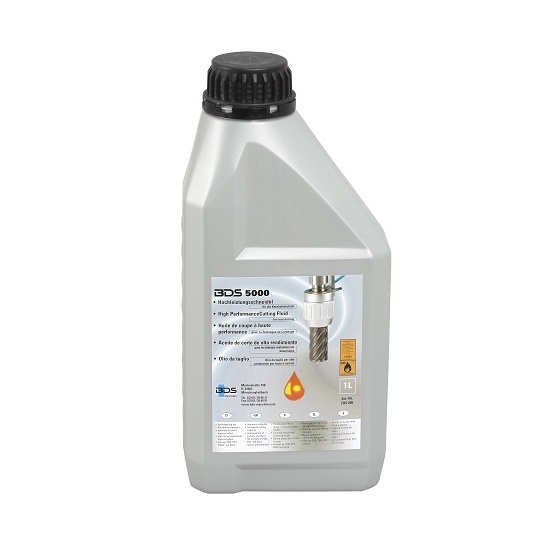 The base materials used are not listed in the catalogue of substances hazardous to water. BDS 5000 is not subject to labelling. Organic basic material with additives. 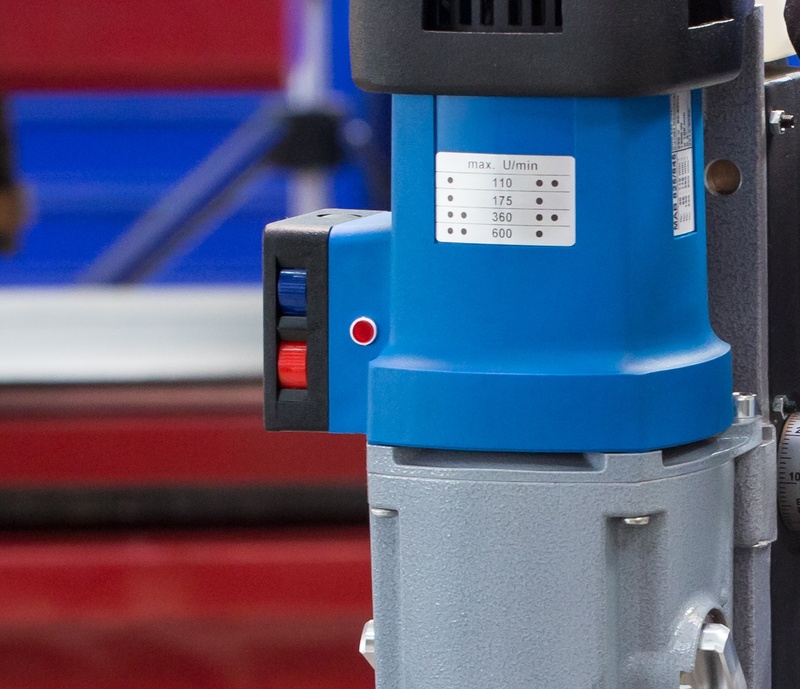 A motor protection switch protects the milling motor against overloading. Switch OFF the machine and re-start after few minutes. The surface must be smooth and may not have any burn points, slag, welding joints or similar. Before beginning with milling, remove surface unevenness. Place the machine onto the upper side (power connecting cable ). Release the locking mechanism (2) on both sides of the machine. 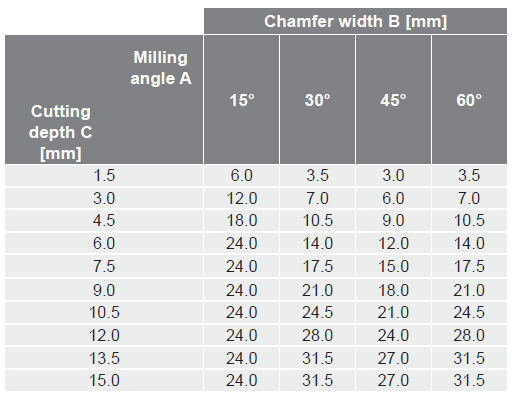 Set the desired milling angle. The milling angle can be viewed on the scale (1). Tighten the locking mechanism (2) on both sides of the machine. Place the machine onto the upper side (power connecting cable). Release the locking mechanism (1). 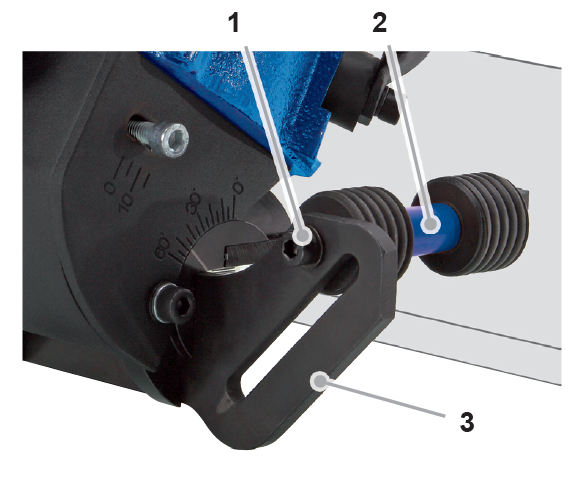 Set the desired chamfer angle by turning the adjusting screw (3). The chamfer width can be viewed on the scale (2). Tighten the locking mechanism (1). Mount the plate (3) according to the illustration. Fix the guide rollers (2) in the borehole (1) with the washer and nut. Mount the plate (1) according to the illustration. Fix the guide rollers (3) within the oblong hole with the tnuts (1). 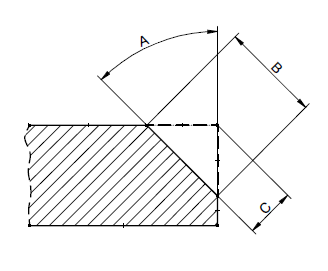 The position within the oblong hole depends on the pipe diameter. Yes, the AutoCUT 500 and SKF 25 bevel stainless steel plates. 8 sides = 400 meters. 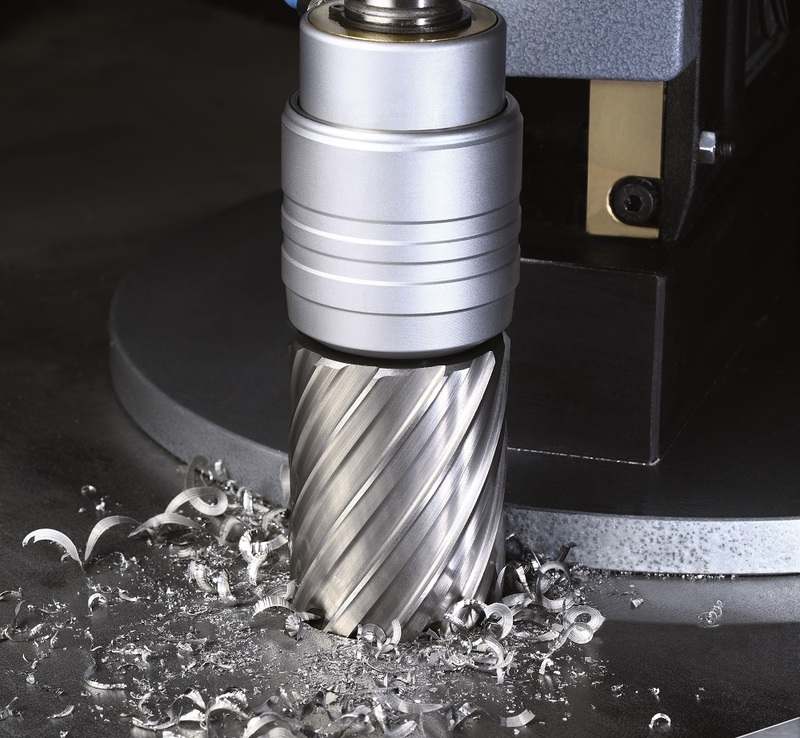 Which milling cutter does the Auto CUT 500 automatic beveling machine use? 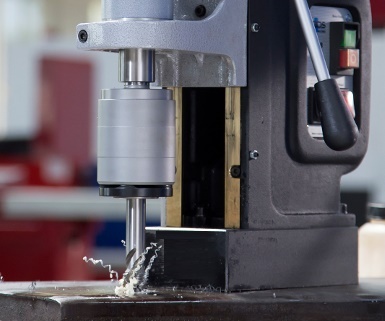 The image on the left side is the arbor milling cutter ZFR 500 for AutoCUT 500 machine. The image on the left side is the arbor milling cutter ZFR 250 for SKF 25 beveling machine. 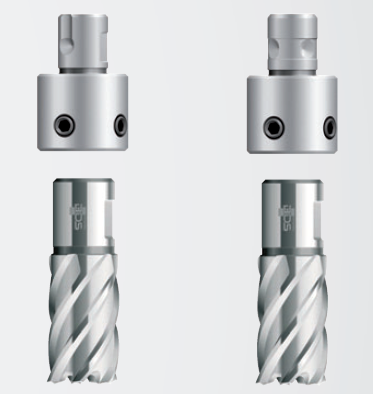 The image on the left side is the milling cutter ZFR 300.3. 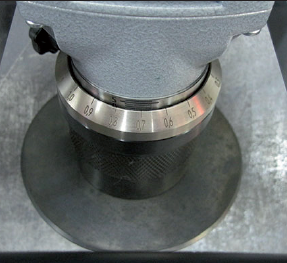 The image on the left side is the milling cutter ZFR 450.3. 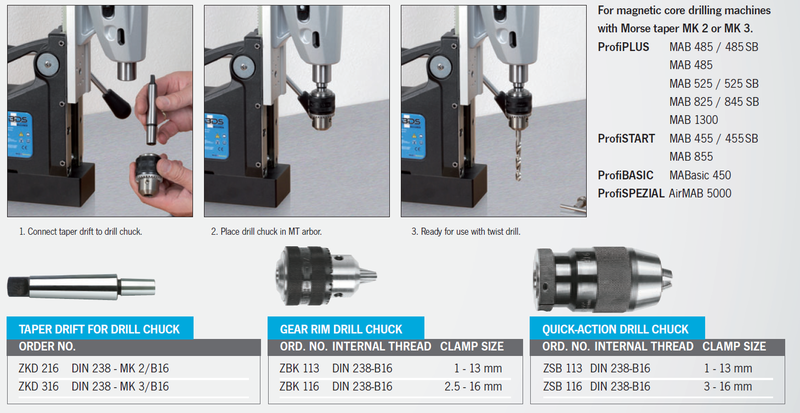 The image on the left side is the milling cutter ZFR 4520.3. Loosen the side clamping screw. 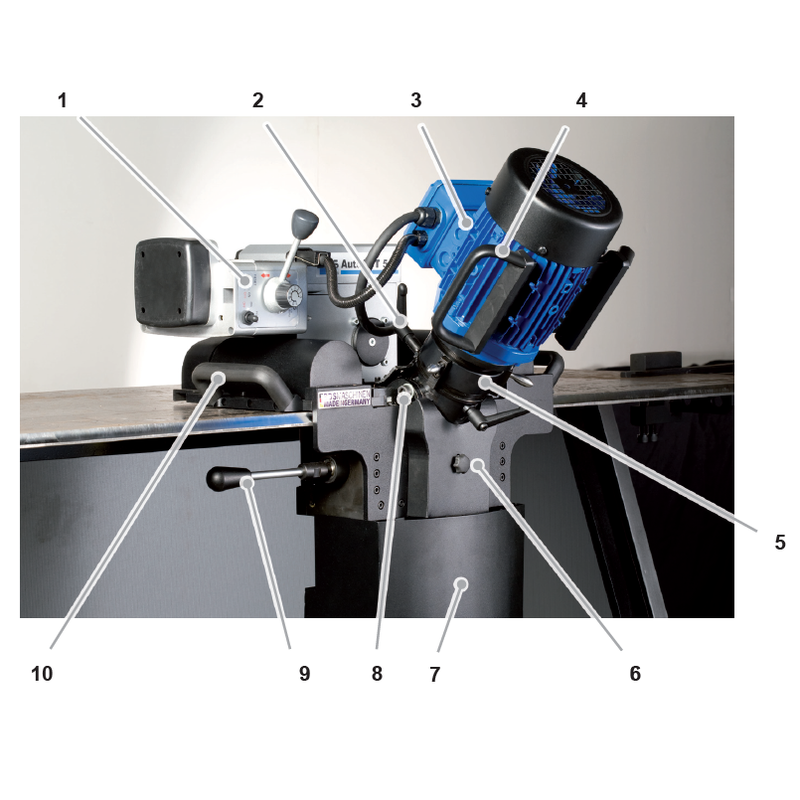 Set the desired chamfer height by turning the entire machine head. The set value can be read from the ring scale. Tighten the clamping screw again. Lock the ON/OFF switch in the switched-on position by pressing the locking mechanism. 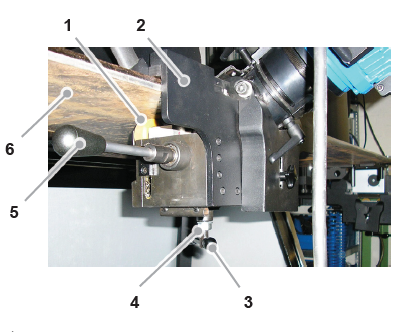 Align the workpiece to be processed horizontally and secure it. Set the chamfer height, see section Setting the chamfer height. Insert the plug into the mains socket. 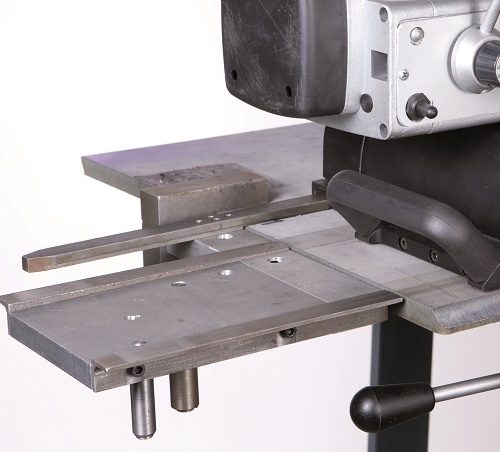 Clasp both handles and put the machine upright with the supporting plate onto the workpiece so that the milling milling cutter does not move onto the workpiece. Switch the machine on, see section Switching on the machine. Wait until the maximum speed is reached. This process takes approx. 3 seconds. 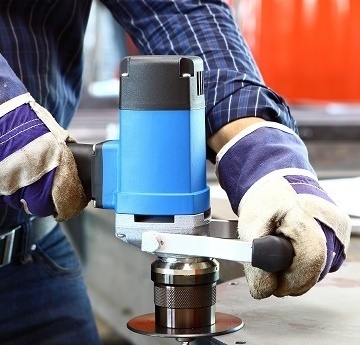 Push the machine slowly and evenly in the opposite running direction of the tool. Before switching off, remove the machine from the tool. Switch off the machine, see section Switching off the machine. Pull the plug out of the mains socket. Unscrew the housing from the motor. Loosen and remove the milling cutter with the tool supplied (SW 22 openend wrench, hook wrench). Screw in the desired milling cutter. Screw on the housing again.